There’s nothing Michael Jordan loves more than a challenge. Nothing that gets his competitive juices firing on all cylinders like someone saying he can’t do something. He became one of the greatest basketball players of all-time by repeatedly proving people wrong, especially those who bet against him. Today Michael Jordan is still proving naysayers wrong and proving that he is someone that you never want to bet against. Check out what happened in Lake Tahoe earlier this month where a fan bet Michael that he couldn’t hit the green. How do you think that turned out? Just take a look. If you are looking to grab a jaw dropping autograph from the games best player, look no further than your friends at Upper Deck. This Friday Upper Deck will be releasing a product called 2011 All-Time Greats Basketball that will be LOADED with hard-signed, authentic Michael Jordan autograph cards. If you’ve never had the luck of pulling a Jordan autograph card before, this is your shot. 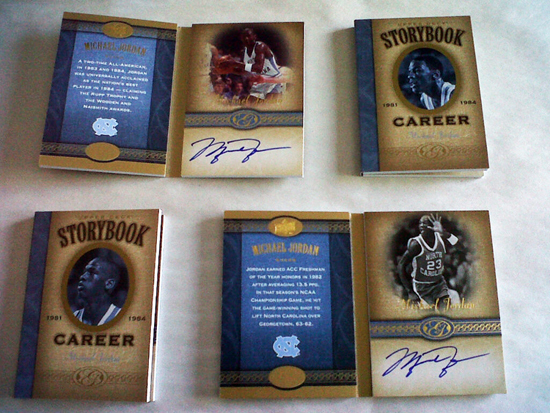 And if you don’t get lucky enough to grab a MJ autograph, the checklist is incredibly strong, so you will likely not be disappointed. These are just some of the amazing autographed Michael Jordan cards that can be found in 2011 All-Time Greats Basketball from Upper Deck. Also, Upper Deck Authenticated continues to have an exclusive agreement with Michael Jordan for signed memorabilia and we bring some of the most compelling pieces in the industry your way. Just take a look by clicking here. Producing authentic, super-premium collectibles that are truly unique is what we do best here at Upper Deck. 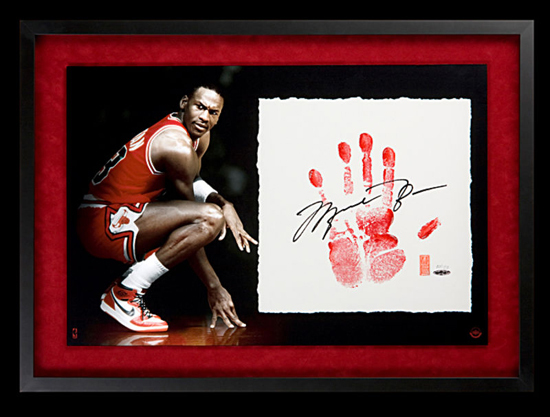 Like the new Michael Jordan "Tegata" piece that features an imprint of MJ's palm. While we have learned that you should never bet against Michael Jordan, if you are a sports fan, he remains an athlete that you should absolutely invest in. He gave you the moments that gave you goose bumps. He made you believe that he really could fly. Promise yourself that one day you will own an authentic signed Michael Jordan item. It is more than a collectible. It’s a cherished memory. It’s a belief that somewhere within all of us is the ability to do the unbelievable. It’s hope. It’s Upper Deck. While my customers have pulled over 50 Michael Jordan autographs from our boxes, we are really really really wishing for a All-Time Greats Michael Jordan Autograph.